Holidays at last! You have just arrived in Samos and you can’t wait to explore this amazing Greek island. We have good news for you: in Samos you will not get bored. It’s a unique place that combines history, natural beauty, culture, gastronomy and a spectacular seaside. 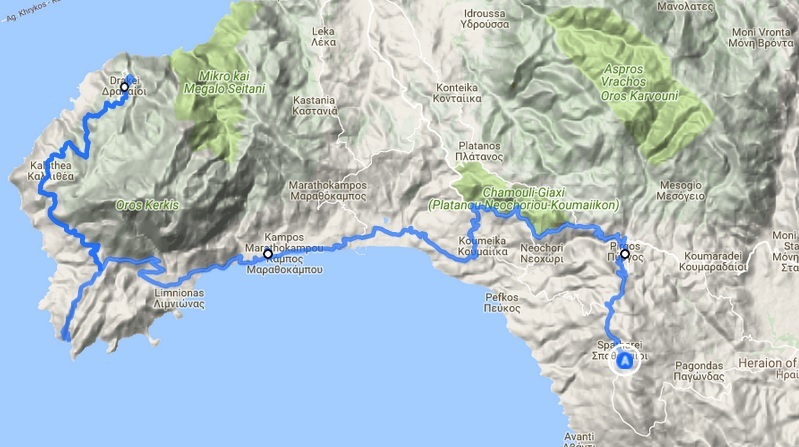 We have designed for you the ultimate road trip around Samos in order to help you not miss anything. Here we go! Before you start make sure that you have rent a car in Samos. Aramis has the best offers for Samos Car Rental. Your fist day shall start from the capital of Samos, Vathi. The main road will lead you to Pythagoras Square and the Lion, this emblematic sleepless guard of the island. Around the square there are numerous coffee shops where you can enjoy a cold Frappé coffee (a Greek foam-covered iced coffee) under the sun. After that, you can visit the market and check out the local products. 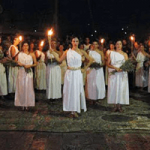 Nearby, you will find the Archeological Museum of Samos, the public garden and the beautiful church of Agios Spyridonas that holds many ceremonies like baptisms, weddings, masses etc. The locals call this area “Ano Vathi” and it’s a place of distinct beauty and panoramic scenes of the harbour. Park your car in a safe location outside the narrow roads and get ready for some uphill walking. Explore the tiny streets, have a glimpse of the locals and travel back in time admiring the architecture of ancient Samos. At the top you will find the amphitheater and the old church of Ai Giannakis. It’s time to visit the seaside. For a start, we recommend Agia Paraskeui, a little fisherman town. Although the location doesn’t have many options for leisure per se, the scenery along the way is quite spectacular, while in the nearby locations you can find beautiful beaches. Next, if you fancy visiting the old monasteries of the island, Zoodochos Pigi is definitely a must. Located on the mountain of Rabaidoni, Zoodochos Pigi is a beautiful structure facing Ephesus in the opposite coast. It was founded in 1756 and since then it has been known for its greatness and holiness. On a nearby coast you can find the beach of Mourtia. It’s a beautiful beach that many locals choose for swimming, away from the busy and more touristy beaches of the island. On your way back you can have a stop at Agia Zoni, another beautiful monastery in the area. In the afternoon we recommend the little fishermen town of Posidonio. It’s a tiny little town built on a beautiful coast. If you are hungry, it’s a perfect place to taste some fresh fish. 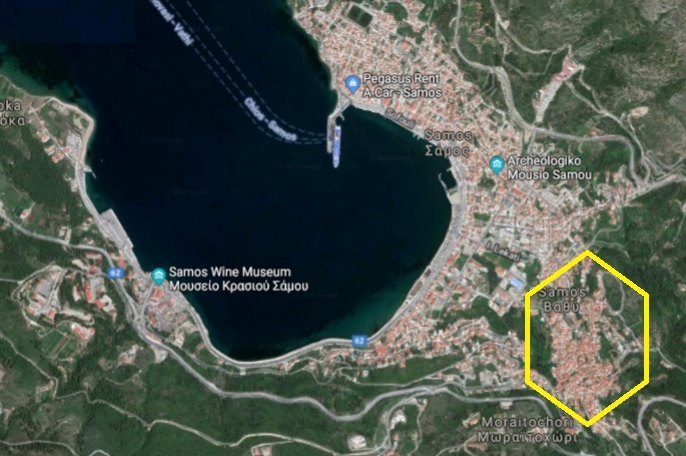 The second day is dedicated to the most historic and tourist-drawn area of Samos. Your day can start from Pythagorion, a picturesque village with the beautiful port named after the philosopher Pythagoras. It’s a place with various monuments, coffee shops, restaurants and shops but also with one of the most interesting museums of the island. Next stop, the Tunnel of Efpalinos. 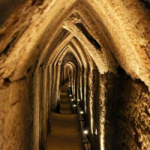 It’s an antique aqueduct, built in the 6th century BC admired for being excavated from both ends. Don’t forget to visit the Monastery of Panagia Spiliani and the Cave of the Virgin Mary which is located in the same area. After this amazing tour, it’s time to visit the temple of Hera, on the way to Heraion. It was the main sanctuary of ancient Samos, and one of the most important of the world at the time. Next, you can visit the little village of Heraion and enjoy a fresh meal next to the sea. In the afternoon we recommend the monastery of Timios Stavros, founded in 1592 by the monk Nilus and the beautiful beach of Psili Ammos for some swimming and relaxation. Your third day on the island shall be a day dedicated to its natural beauty and amazing seaside. 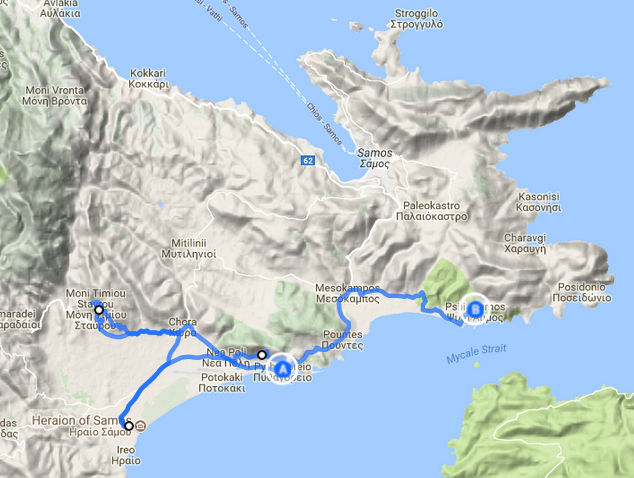 Your ride will start from the beautiful village of Kokkari, a developed tourist center with numerous things to do. Enjoy your coffee next to the sea and get ready for some adventure. Next stop Vourliotes, a traditional village of 500 inhabitants built on the mountain slope. In the village there are nice restaurants and a beautiful square. The next village that should be visited is Manolates. It’s undoubtedly one of the most beautiful villages of the island. Enjoy the ride and stroll through its pretty narrow streets. The third village to explore in the area is called Ampelos. After this beautiful ride along mount Karvouni, we recommend Karlovasi and Potami. Potami is a beautiful beach. In the same area you will find the famous waterfalls and you will be stunned by their crystalline waters and the wild nature. On your way back, you should stop and admire the beautiful beaches of Tsamadou and Lemonakia. For your fourth day on the island, we recommend the western side, starting from Spatharei village, built on a high altitude and with amazing scenery. Next, Pyrgos, a village where you can buy souvenirs. 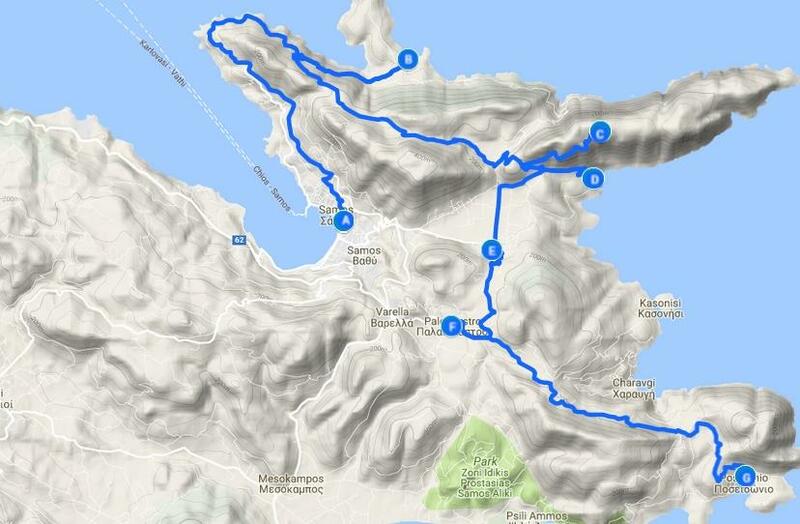 Continue your ride, visiting Marathokampos and Votsalakia, two towns built next to the sea. Next to Votsalakia, you will find the beach of Psili Ammos, an amazing place for swimming and some relaxation. If you wish to have a panoramic view of the Aegean Sea, we suggest that you continue your ride until the little village of Drakei. The scenery is breathtaking while this village is considered to be the most remote of the island. «Ηραία – Πυθαγόρεια» 2017 στη Σάμο: Ένα φεστιβάλ που μας μυεί στο αρχαίο ελληνικό πνεύμα και πολιτισμό. Ευπαλίνειο Όρυγμα: το όγδοο θαύμα της αρχαιότητας στη Σάμο! Η “Aramis Rent a Car” είναι μια υγιής, πλήρως ανεξάρτητη ελληνική εταιρία που προσφέρει ανταγωνιστικές τιμές, ελκυστικές προσφορές και εξαιρετικό επίπεδο παρεχόμενων υπηρεσίων για μίσθωσεις και ενοικίασεις αυτοκινήτων.